Editor's note: CNN has asked its journalists across the country to offer their thoughts on how the economic crisis is affecting their cities. In this installment, All Platform Journalist John Couwels reports from Orlando, Florida. 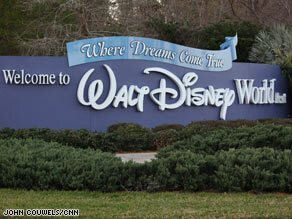 Walt Disney World in Orlando, Florida, has announced that it will lay off employees. ORLANDO, Florida (CNN) -- Orlando: What first comes to mind? Walt Disney World or Universal resorts, perhaps? The two parks are the nation's biggest tourist draws. As a new resident of Orlando, I find that the tourist areas are more removed from the city than I thought. Still, some people in the area where I currently live either work or have business dealings at tourist attractions. As with every city in the United States, Orlando is dealing with the fallout of an economic slowdown. Tourism officials expect an 8 percent to 10 percent drop in tourism dollars for 2009. Nonetheless, during a recent visit to Disney's Magic Kingdom with my family, I experienced a packed park. My first visit in 10 years: The park did not seem any different except for the $129 I paid for a six-month Florida resident pass. Disney World recently announced a major loss in income and that layoffs are expected. Sources within Disney say the layoffs could begin this week. Disney will not say how many people will be eliminated while it restructures and consolidates operations. I have not heard panic among businesses and city officials over the Disney announcement, despite the fact Disney World says it is the biggest single-site employer in the United States with 62,000. Disney spokesman Mike Griffin said: "We are bigger than the Pentagon." Disney told me cuts would be significant, affecting back office workers. Griffin said guests visiting the parks would not see any difference. Danielle Courtney, spokeswoman of the Orange County Convention and Visitors Bureau, said she was sure that "Disney will provide a value experience for their guests." But she said Disney is doing what every other business is doing: cutting costs. Orlando's economic and development director, Bill Billingsley, said the city has not lost a significant amount of jobs. Billingsley is concerned about the Disney layoffs but optimistic on the limited effect on the city's economic health. From the big corporations to the funky little tea and sandwich shop east of downtown, businesses are feeling the pinch. The owner of Pom Pom's Teahouse and Sandwicheria was telling my friend how she had to cut everyone's hours to part time to save on expenses. The store has been open since 2006. Owner Pom Moongauklang, a trained pastry chef, told me she's doing whatever it takes to stay open. Pom cut her four employees' hours instead of their jobs, lowered prices and extended hours to 24 hours on the weekends. Pom said of the 60- to 70-hour work week: "It's killing me, but it's working." Along the epicenter of tourist hotels, restaurants and T-shirt shops, International Drive business owners say they are hurting. Aby Aly, owner of a gift shop selling goods from T-shirts to plush dolls, said that "business is off by 35 percent, and people are not buying." As I drive around town, I do not see a large number of closed-down stores. Like other cities, Orlando has seen big national chain closures like Linen-N-Things and Circuit City. Yet at two of the area's outlet malls, you would never know there is an economic crisis. I waited 10 minutes in line to enter the parking lot. In the suburbs where foreclosures are their highest, more businesses have closed their doors. As I looked for a house to rent I was surprised how a one-bedroom condo in downtown was the same price as a four-bedroom house only five miles away. Real estate agent Sue Bee Laginess said the city has a glut of homes and condominiums for sale or rent. She said her office has seen business double from four months ago because of the low prices. The agent said owners have either lowered prices, been foreclosed on or are selling the house for the amount owed to the bank. For one store in my new quaint neighborhood of College Park, business has never been better: Top Drawer Consignments. Fred Rodgers, a former Disney designer and one of the store's owners, said "the tough economy is helping us." Shoppers say they save money buying used furniture. Yet College Park has not been immune from the economic crisis; real estate offices and gift shops have closed there, too. Despite the downturn, Orlando officials believe their city has fared better than most. Orlando's economic development director told me Orlando is building a medical city that will add 10,000 jobs in the coming years. Orlando Mayor Buddy Dyer will give his State of Orlando speech Wednesday, the same week the area's biggest employer could begin layoffs.